A Diamond Select Toys Release! The Metaluna Mutant is back in black (and white)! 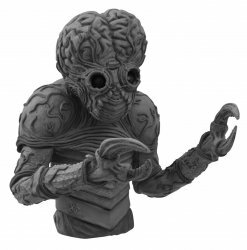 The horrific monstrosity that served a superior intelligence in the sci-fi classic This Island Earth (as well as the Mystery Science Theatre 3000 takedown) is getting the silver-screen treatment with a new, film-accurate grayscale edition of his vinyl bank! The latest release in Diamond Select's new line of vinyl banks was a no-brainer. After all, if you were going to make an 8-inch bust featuring highly detailed sculpts and paint, what monster would you want to see done right? The Metaluna Mutant, of course! He'll still make a big impression on your shelf, with high-quality sculpting and paint details, plus his brain alone will hold several dollars in change, thanks to the coin slot on his back! Collectors Note: These cool vinyl banks were featured on display at the San Diego Comic-Con and are very well done. Packaged in a clear polybag not boxed from the manufacturer. 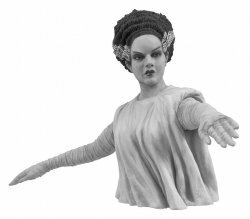 Also want the Bride of Frankenstein B&W Bust Bank? Click the convenient Buy Both button below!